Artist Katie Daniels did this installation by 'embroidering' in NYC last year. She used plastic fence weave, spools, lids and cable ties. cobalt123 snapped this pic of a chain-link fence tarted up with CDs. Bet it keeps the crows at bay too. These little 'floating' hearts are woven within the links with yarn. This large installation, called The Flower Garden Fence project, was done by the Ladies Fancywork Society. The crocheted flowers add a bit of life to the Downtown Denver Union Station neighborhood. 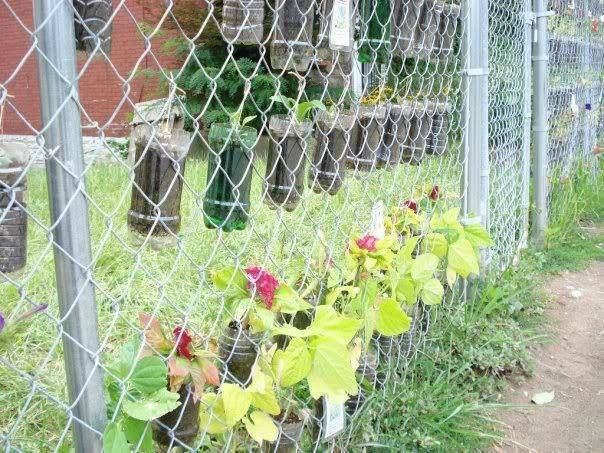 Jessica turned her chain link fence into an urban garden using plastic bottles. You can read more about her project here. Awesome idea. Very original to decorate those ugly chain fences. PS I wove the fronds horizontally, and did not need to thread through every opening. Understand that with this weaving, both sides of the fence were covered. A pair of pruning shears and something to sit on were the only other things necessary. If you live where there are palm fronds that are cut from existing palms, get to them before they are hauled away, and weave them through the fence, even going over the top, to obscure the fence. I did this at a fine old home, one of the last remaining pre-massive redevelopment, that I was renting in Sarasota, FL. With the chain link fence, the large amount of broke glass, and other detritus that made this wonderful house the object of vandalism, the weaving of the fronds through the fence, in large part, brought too much attention to the home, and it was sold within months, even though long-term realtors and residents of the area had never before "seen" it. (Sorry about that. It pained me so to have to leave, and to tear out the improvements before I vacated). Bottom line - the fronds dried hard, and could have been easily replaced as there was plenty of free material. The look was far better - elegant, even, than anything shown here, because all the fencing was obscured. We have honeysuckle growing all over ours.. and I didn't even have to plant it! We live in woods and it just invited itself to the 24x20 chain link dog yard. I'm thinking of hanging little crafting gems and jewels all over it from Walmart/hobby lobby, whenever I see them on sale. We planted Virginia Creeper at the bottom of our huge ugly chain link fence. I was suprised how quickly it grew! The bonus is the beautiful red leaves in the fall! plant morning glories as early as possible in the Spring right under your fence, year after year you will get a thick wall of green leaves great for privacy and lovely flowers in the mornings too. Needs to be trimmed every few weeks as they can get out of hand if left alone for long . . . I wonder how they did the lace work on the first fence? Beautiful! Interesting ideas! Thanks for this post. 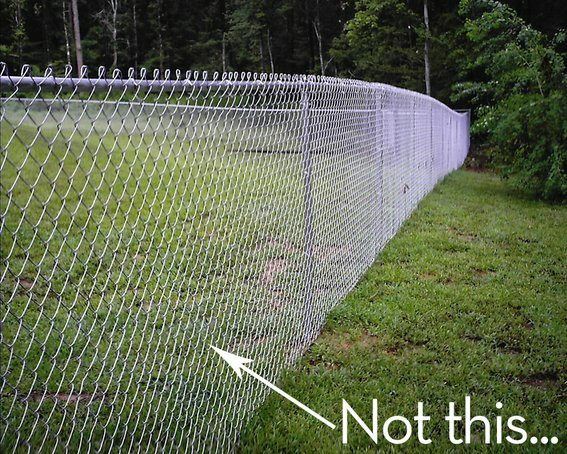 I'd hate cities a lot less if fences looked like these! Nikki, you are quite the gardener!! And that citrus is a lovely camouflage. Great idea. 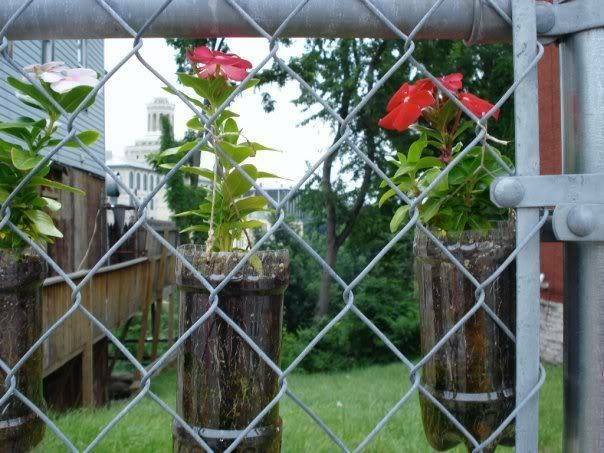 Very original to decorate those ugly chain fences. Oh and yelena, there are solar powered string lights but they're inordinately expensive and usually only 10-15 bulbs long. At almost $4 a bulb, that's an expensive backyard project! Chrisjob - I don't have any right now but I'll take some in the next few days (when I'm actually home at a time when the light is right!) and send them to you soon! I really like slippyoink's idea. I wonder if there are any solar-powered options for string lights? Our entire yard is fenced in with the ugly chainlink fence and I'd love to prettify at least some of it. I might borrow Jessica's idea as well and plant some herbs and greens too.